Week #1 Show Teaser Hot. Young. Witches. 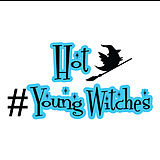 Check out the #BTS of #HotYoungWitches! this idea needs a lot of work. It kind of looks like there was not a lot of thought put into it. You should hire Aaron to be your lead script writer. Would you believe what excites me most about this project is eventually, when you win and reach season 3, you can do a whole run of episodes where the Witches accidentally open a time warp and end up in Salem during trials. There's nothing quite as funny as mass burnings. Different concept. Looking forward to seeing more! Super excited about week 1!